As organizations strive to securely deliver high-quality, high-availability services to users around the world, they grapple with ever-changing user populations, access points and applications that are increasingly dynamic, distributed and mobile. While the traditional forms of server, network and data security are effective in their specific domains, securing people as they interact with these assets is vital—since their access may not be limited to a specific server, network or database. Today’s applications are increasingly distributed on cloud infrastructures, and they often comprise capabilities and data from widespread sources or even different organizations. 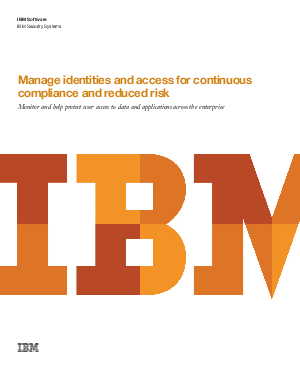 But that is only part of a larger challenge related to identity and access management (IAM). Effective security still depends on services being delivered solely to the right people, with the right privileges—including employees, suppliers, partners and customers—across the multi-perimeter enterprise. At the same time, escalating security and privacy concerns and a renewed focus on corporate oversight are driving governance, risk management and compliance issues to the business forefront.